Fiona Mozley grew up in York and later lived in London, Cambridge and Buenos Aires. She has gone full circle and is now back in York, where she is writing a PhD thesis on the concept of decay in the later Middle Ages. 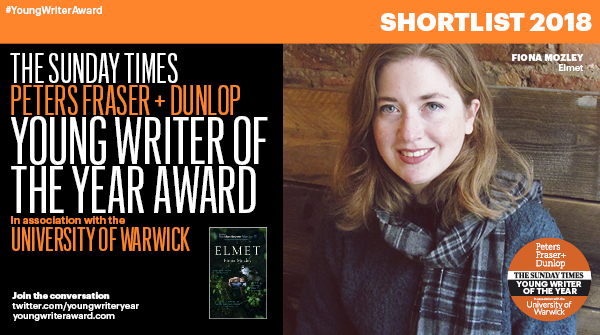 Elmet was her first fiction book and was longlisted for the Man Booker Prize for fiction. She currently works part-time at The Little Apple Bookshop. Daniel and Cathy live in a home that their father, John, built with his own hands. He is a huge man and an acclaimed bare-knuckle boxer but as a parent caring for his children, he is a gentle giant. They were never like the other children, and have an alternative upbringing, dropped out of school, spend their days foraging and hunting for food and share their fathers roll-ups and cider. He has told them that this is their home forever, but he has no truck with details like who actually owns the land. I normally don’t read Booker Prize books as I have not always got along with them in the past but this was on my list to read as I was fortunate to win a signed copy. It is a dark tale of the underground culture of a northern village, with the characters deeply rooted in the very landscape they inhabit. I thought it did take a little while to get going, as Mozley takes time setting the scene and builds the atmosphere, however, the last quarter of the book flew by. The prose is sparse yet visceral and charged. Her portrayal of the characters, whose flaws give the plot the friction it needs, make this tale of a family who have stepped away from contemporary society, unnerving and disturbing. There are lots of things happening online concerning the award if you want to follow it.